The United States President Donald Trump and North Korean leader Kim Jong Un signed a joint agreement, according to which Kim committed for 'complete denuclearisation of Korean Peninsula', as per media reports. A while back, Trump said that the denuclearisation process for North Korea is starting "very, very quickly." Trump praised Kim saying, "I learned he's a very talented man. I also learned he loves his country very much." Kim is a worthy negotiator and he had developed a "very special bond" with Kim, Trump added. In response, Kim said he wanted to express gratitude to Trump for making the meeting happen. "We had a historic meeting and decided to leave the past behind," Kim said through a translator. Trump also said he would like to invite Kim to the White House. Earlier in the day, the two leaders arrived at the hotel along with their respective motorcades. They were accompanied by their respective officials. Further, President Trump and Kim posed for a photograph as the entrance of the venue was decked up with flags of the US and North Korea. 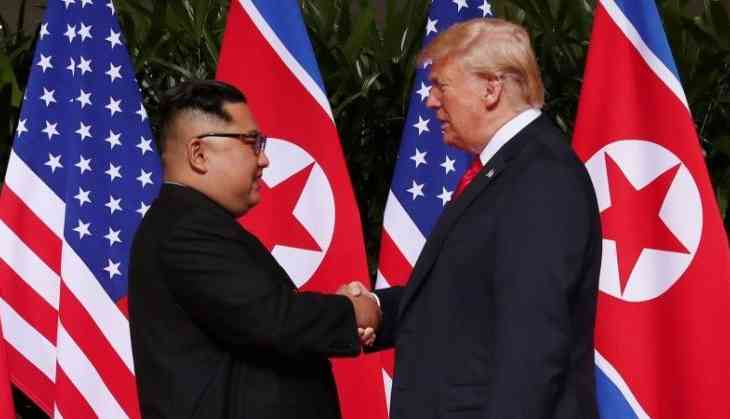 In spite of Kim threatening to call off the summit talks following the 'Max military drills' and Trump announcing to call off the event, citing "tremendous anger and open hostility" from North Korea as the reason, the historic summit finally culminated successfully. Standing again in front of the US and North Korean flags, where they started the historic day, Trump and Kim shook hands one final time. Trump will depart for the United States at around 7 p.m. from the Paya Lebar Airbase, after holding a press conference at 4 pm.